Because I detest the harshness of smoking, I find relief vaping cannabis oil and love trying different terpene profiles and combos. After a long workout, my muscles were feeling sore and tight. Did I mention I frequent the gym? I go to the gym. I’m great fun. Instead of napping after exercise, which disrupts my bedtime and leaves me groggy, I’m reaching for NUG’s Strawberry Banana Smoothie cart to hopefully relieve my pain and help me sleep. Know for their chocolate bars, flower and concentrates, NUG prides itself on innovation, accountability and fun. This Bay Area brand advocates a “work hard, play hard” lifestyle, treating cannabis as inspiration for active lifestyles while trying to shift the negative perceptions of the industry. I’m a huge fan of the strawberry banana hybrid strain, an indica-dominant cross between Banana OG and Indian Bubblegum, that pairs a gentle body high with a refreshing, wakeful head high. However, it’s unclear if this Strawberry Banana Smoothie vape cart is actually derived from that strain. Will it be as satisfying, effective, and accurate as my beloved flower? Let’s see how this cartridge stacks up. 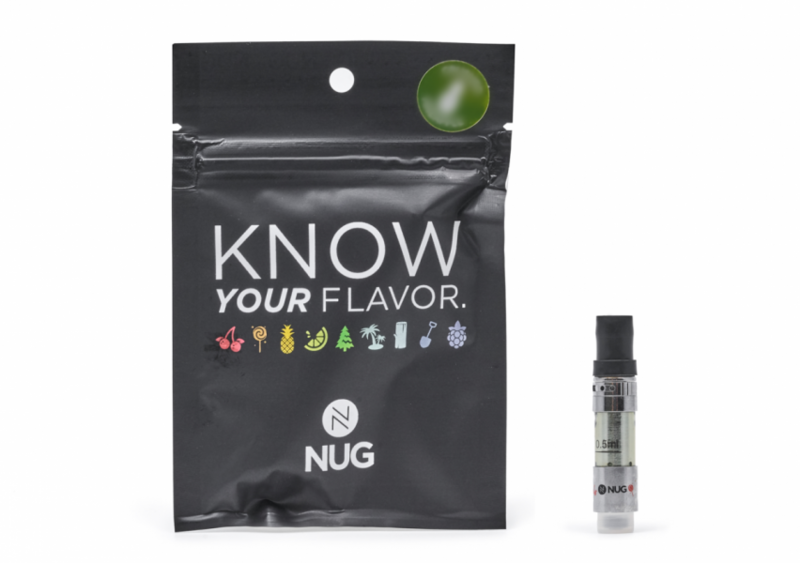 The packaging was nothing fancy; just a bare bones black plastic bag that reads, “Know Your Flavor” with pictures of colorful fruit, trees, a wooden stump and a shovel–presumably symbols representing the different terpene profiles NUG offers in all their cartridges. The labeling meets the minimum legal requirements listing THC (68%) and CBD (about 1%) percentages with their lab test results, the derived strain and quantity contained inside. Beyond those standards, the labeling wasn’t very descriptive or helpful. A maroon sticker in the top right corner of the initial black bag says “Banana Strawberry Smoothie” with corresponding pictures of a banana and strawberry. But according to the inner bag sticker and NUG website, that’s not even the right name! It’s “Strawberry Banana Smoothie!” Or is it? The brand needs to clarify. As for design, the cartridge is glass and metal. Unlike most, this one has a short, thick, and round metal mouthpiece with black plastic cap to keep yours protected. 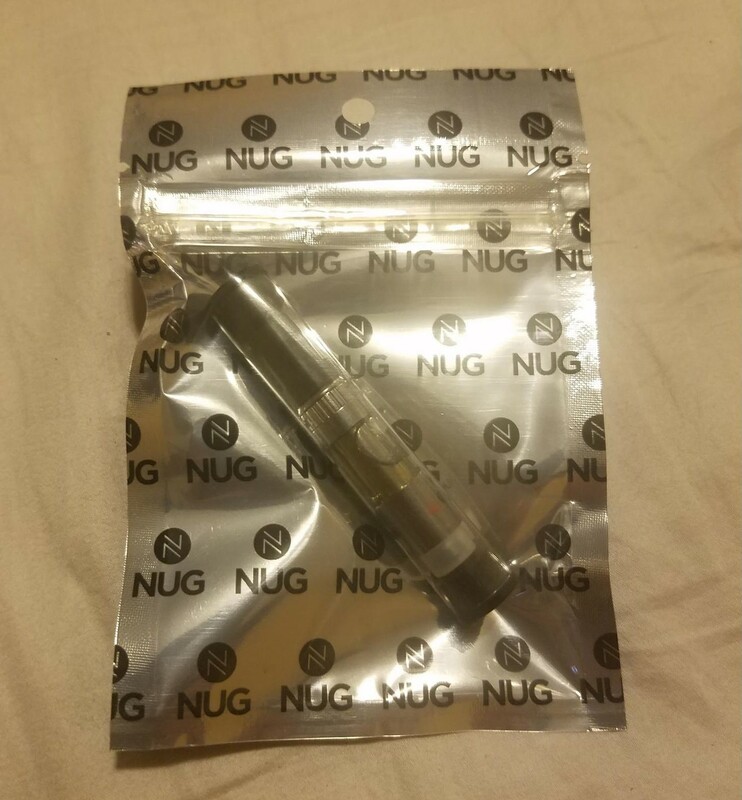 The NUG logo is printed right below the tank along with its size (0.5ml) along with some cherries, presumably repping the terpenes. At first, I couldn’t draw too much vapor. I double checked the standard 510-thread and reconnected it to my pen battery. Then I realized this NUG cartridge has a plastic adjustable mouthpiece to customize air flow through each hit. This feature was a bit confusing; I still can’t figure out why you’d want less airflow but I’m sure there’s a practical reason. I just couldn’t find much info online or on the package (more on that in a bit). Still, this cartridge was harsh and left my throat feeling scorched. It could be from the unpleasant flavors or it could have something to do with the adjustable airflow valve. Whatever the issue, it was hard to vape after three slow pulls. The bold strawberry and banana flavors hit hard and lingered on my tongue. I laid on the floor stretching in pigeon pose, occasionally bringing the metal mouthpiece up to my mouth. Although I did feel a high come over my head and body, it didn’t last long. After four hits I felt too nauseated to consume any more. I’d give this another try if NUG improves the oil quality and flavor. It tasted more like artificial flavoring than a terpene-heavy oil, making the experience a little disappointing. And while I know different vape manufacturers use different extraction techniques, the flavor made me feel a little queasy and failed to deliver the muscle relief I desperately needed after my workout. Did I mention I go to the gym? I go to the gym. I’m great fun. 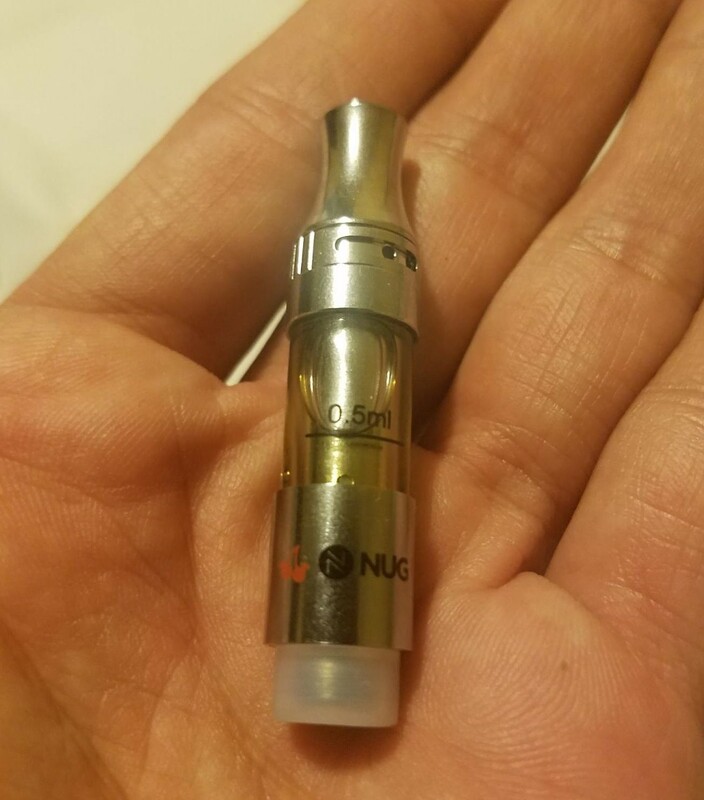 Luckily, you won’t pay much for this .5g cartridge, around $33. Some of you might really enjoy the flavor and have a more positive experience with this strawberry banana vape cart. (If you like sitting in a small closet consistently spraying Febreze you’ll love this). But it just wasn’t right for me. Came in a plastic bag with a resealable opening. Inside that plastic bag was another, smaller resealable bag just to get to the plastic tube that housed the actual vape cartridge. While layered packaging is appreciated, it doesn’t seem necessary. Innermost bag containing the plastic tube had some minor graphics printed on it, but I had to go through several layers of plastic before I got to any significant visual packaging. Strain name was printed on a sticker affixed to the external package, which could easily fall off or get switched by someone. NUG should invest in better labels that includes the strain name directly on the package itself. The strain name listed on the external label (banana strawberry smoothie) is different from the strain name listed on the inner bag and on the NUG website (strawberry banana smoothie). It seems inconsistent and not very well reviewed. The label also had different terpene profiles depicted as various types of fruit, candy, and a shovel (earthy flavors?). While it did include a picture of a strawberry, it also included images of a cherry, a pineapple, and what appears to be a lollipop (because why not). Customizing the imagery for each individual strain would go a long way. Cartridge uses metal and glass in lieu of plastic. Includes a plastic airflow valve, which seems unnecessary and introduces plastic into an otherwise well-constructed cartridge. Fruit “smoothie” flavor tasted nothing like the terpenes you’d find in cannabis. Tasted more the artificial flavoring added to nicotine e-cigarettes. A more complex flavor profile would really improve this cart’s quality. NUG should use actual cannabis terpenes instead of trying to produce these extreme smoothie flavors. Harsh and left my throat feeling scorched. Quality could be improved by developing this oil to produce smoother vapor that tastes more like real cannabis. The color and consistency was adequate, not exceptional. My issues with the taste and my subsequent bout of nausea left me unimpressed. The lack of lab testing results doesn’t help. I experienced a brief high blanket my head and body. After taking four hits off this vape cartridge I felt too nauseated to consume any more. Lost some points for the adjustable airflow valve on the mouthpiece, which isn’t very user-friendly. It might occasionally break down due to all these bells and whistles. Worked most of the time, but results may differ from cartridge to cartridge. At about $33, it’s affordably priced compared to other .5g cartridges on the market. Still, it was also a lot less enjoyable than other vapes I’ve used in the past. Try a fruity and effective Absolute Xtracts Pineapple Afghani .5g cartridge for about the same price. After my first pull, the NUG Strawberry Banana Smoothie cartridge gave me a slight headache, the same way a strong perfume or air freshener in an enclosed space might cause. Nothing like the hybrid strawberry banana flower I prefer. I felt a buzzy head high, but didn’t get the prominent indica relaxation I was hoping for. Although it was affordable, there are superior cartridges available for around the same cost. I’d hesitate to recommend this product. Plus it didn’t provide the required physical relaxation I was looking for after my workout. Did I mention I frequent the gym? I go the gym. I’m great fun.